Applications based on the Kahn process network (KPN) model of computation are determinate, modular, and based on FIFO communication for inter-process communication. While these properties allow KPN applications to efficiently execute on multi-processor systems-on-chip (MPSoC), they also enable the automation of the design process. This chapter focuses on the second aspect and gives an overview of methods for automating the design process of KPN applications implemented on MPSoCs. 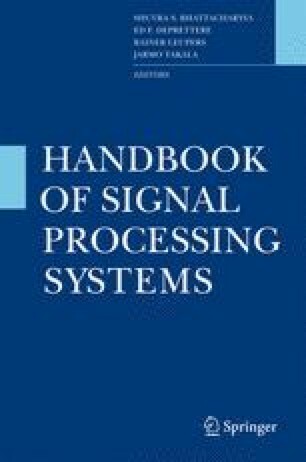 Whereas previous chapters mainly introduced techniques that apply to restricted classes of process networks, this overview will be dealing with general Kahn process networks.